New York designers played it fairly safe for their Fall 09 menswear collections. Gone were the extravagant dandies of past years and in their place we saw rugged American road trip casual styles in denim and leather or no-nonsense business man chic in charcoal or black. The overall silhouette stayed with slim-fitting pants and tailored jackets, though many designers used a layered look, relieving the formality of jackets with long chunky knit jumpers underneath to make a statement without losing the wearability of the clothing itself. The most prominent accessory was the long knitted scarf, often colorful and sometimes the only thing alleviating the monotone grays and blacks. Plaid made an appearance across many collections in shirts. Ostentatious luxury was out and though plenty of cashmere, mohair and silk was used in an understated way, most designers were wary of extravagant display in the menswear collections. 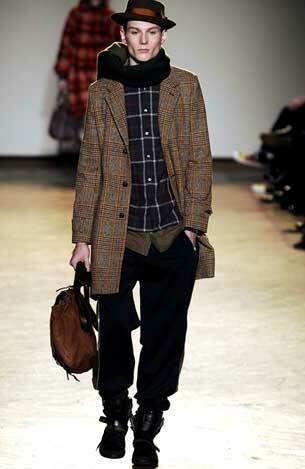 Only a few of the collections showed men’s bags and those that did were fairly conservative with their bag styling. The only collection to have any comment made about its bags in the runway reviews was that of Michael Bastian, who sent a few of his models down the runway lugging massive canvas duffel bags to go with his American road trip theme. One big bag in fabric to match the patterned overcoat was decorated with a Davy Crocket raccoon tail and the same humor was evident throughout the collection, with formal suits tucked into combat boots, an evening suit and bow tie topped off with a knitted beanie. Marc Jacobs’ men’s collection won approval for its stylish combination of casual and formal, layering colorful knits, with plaid shirts and tweed jackets, as well as with more formal suits. Messenger bags, small duffels and totes were all included on the runway. Thom Browne, who stole the headlines at Pitti Uomo in January for his elaborate theatrical show, at New York did a simple showroom presentation of his Fall 09 collection. His unconventional suits and uniforms, with cropped sleeves and trousers were contrasted by ultra traditional briefcases, attaché cases and suitcases all in black leather. Philip Lim favored slim black leather totes to accessorize a few of his men’s outfits on the catwalk, going with the black leather driving gloves and a young, androgynous look. Spurr showed one style of large leather weekender bag in brown or gray carried with fingerless leather gloves and worn with a formal double breasted suit. Nicholas K accessorized a rugged collection of plaid shirts, khaki pants and tough jackets with canvas messenger bags and bulky totes. So while there were a few casual bags on show, it seems that men in search of stylish leather bags are still going to have to look to European designers to supply them, as the New York runways aren’t yet completely comfortable with man bags, even though the European fashion houses have now embraced them whole-heartedly.